Making your own homemade Cherry Bakewell Granola is easier than you might think – and I have it on extremely good authority that it tastes like perfection. I live with the world’s most experienced breakfast cereal eater (probably). My wife literally buys three boxes of cereal every single time we go to the supermarket, and I seriously think one of the reasons we need to move into a bigger house is due to the need for a dedicated cereal pantry. (Okay, so maybe my baking supplies take up plenty of room too). I made Katie some homemade granola for Christmas – a tropical one, a peanut butter one, and a Christmas gingerbread one – and she loved them all. And after seeing some Cherry Bakewell Granola on sale in Waitrose, I knew it was something I needed to get in the kitchen and create my own version of. And here it is. You might think that making granola would be more hassle than just popping to the shops to get some, and yes, of course it is. But only a little bit, so I think that makes it worth it. All you need are some oats, coconut oil, honey, and whatever flavourings and chunky bits you want to chuck on in there. For this Cherry Bakewell Granola, I have gone for dried cherries (obviously) and a whole bunch of flaked and whole almonds. Because you can’t have a Bakewell without them. I also added some white chocolate buttons, because I felt like I couldn’t actually put frosting in there, and this was the next best thing. But, feel free to leave them out if you are trying to me a bit healthy. And apparently, if you add milk to the granola, you can’t really taste them anyway. But I much prefer my granola with some yogurt – cherry yogurt is perfect for this! 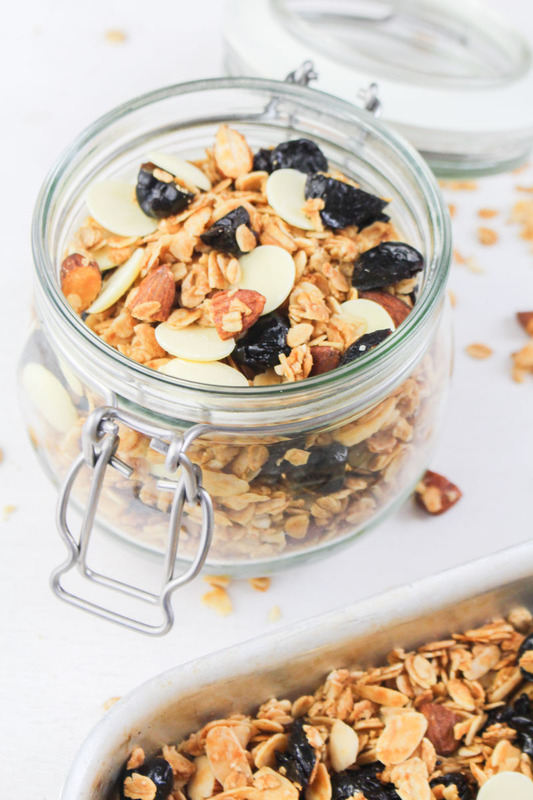 I will definitely be trying a few more quick and easy granola recipes over the coming year – I’m sure Katie wouldn’t mind gobbling down a few more bowls of tropical granola, and I’m already having ideas for more unhealthy granola options… (did someone way chocolate flavoured oats?). In the meantime, get creative in the kitchen and make breakfast a little bit more interesting – check out some of my other breakfast recipes right here. Homemade Cherry & Almond Granola, with a little bit of white chocolate thrown in for good measure. Make breakfast exciting again! Preheat your oven to 150°C / 300°F (130°C fan). Pour the oats into a large bowl, and add the salt, melted coconut oil, honey, and almond extract, as well as the flaked and chopped almonds. Give the mixture a good stir until all the oats are coated. Spoon the mixture onto two wide baking trays and spread out so there is a thin layer of the oat mixture on each tray. The deeper the oat mixture is, the longer it will take to bake. Place the trays into the preheated oven, and bake for 25-30 minutes, stirring every 10 minutes to ensure that all the oats and nuts are evenly baked. The granola is ready once the oats are a golden brown colour - they will still feel a little sticky, but that's okay. 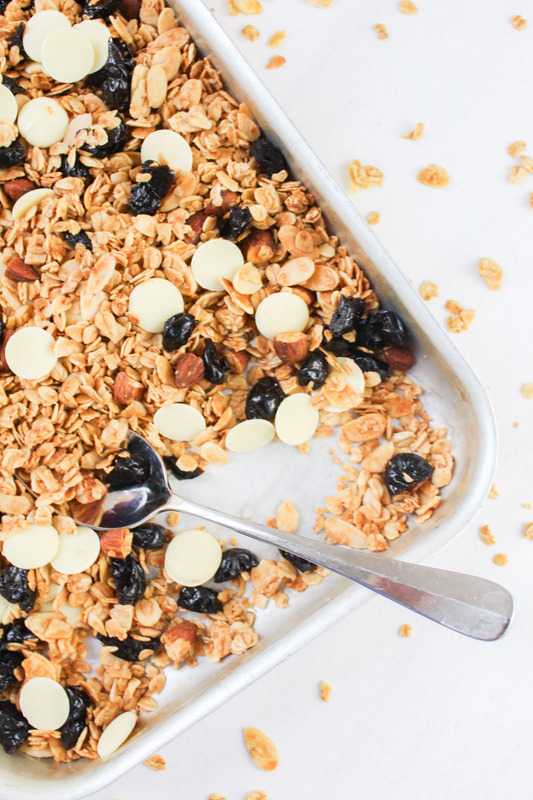 Leave the granola to cool in the trays, and once completely cold, stir in the chocolate buttons and dried cherry halves. 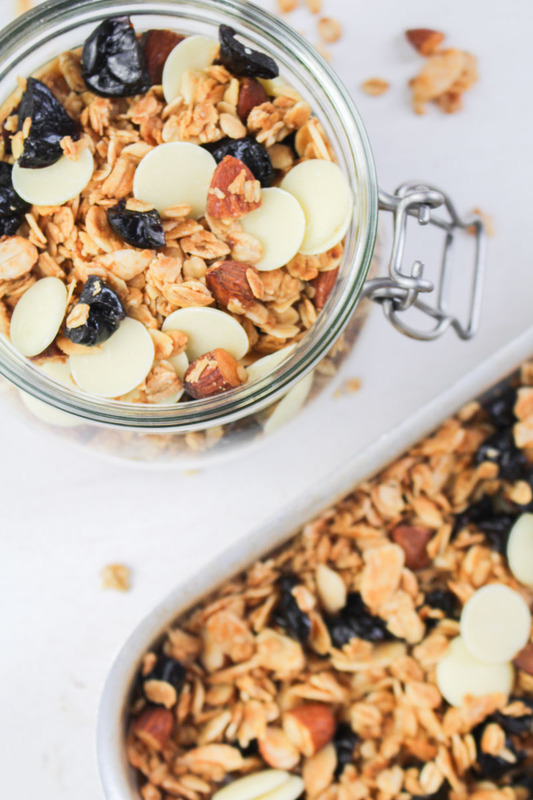 Store the granola in a airtight jar or container, and serve with either yogurt and fresh cherries, or milk. The granola should keep for a month or so, if kept in an airtight container somewhere cool and dry. There is no need to refrigerate, unless you live somewhere really warm and humid. The granola can also be frozen for 3-6 months, and will need to be left out overnight to defrost before eating. 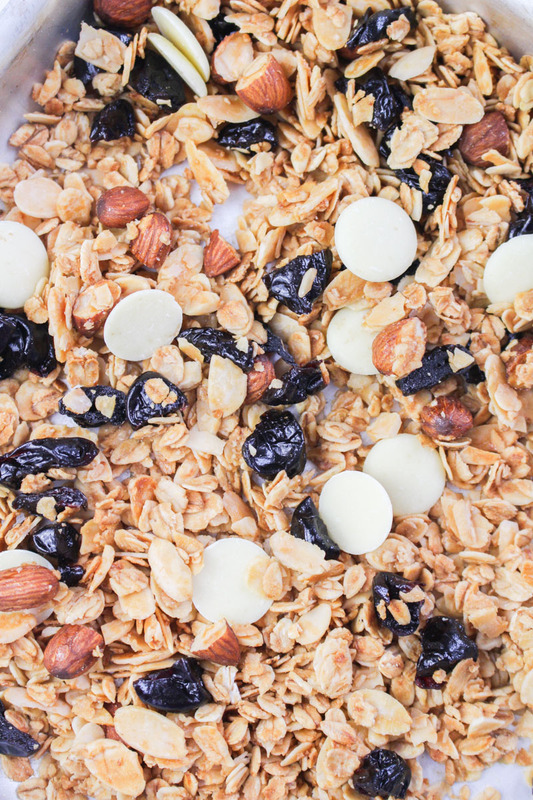 You can keep experimenting with granola any time you like, I love to eat it!